Our Colored Foam Board or Foam Core Board is a very strong, lightweight and easily cut material used as backing boards for artwork ,for sign making, mounting photographic and art prints, framing, screen printing, die cutting, prototypes ,3D design and sculpture. Foam Core board consists of three layers; an inner foam layer of polystyrene sandwiched between a White Semi gloss and a Color Semi Gloss clay coated paper boards. 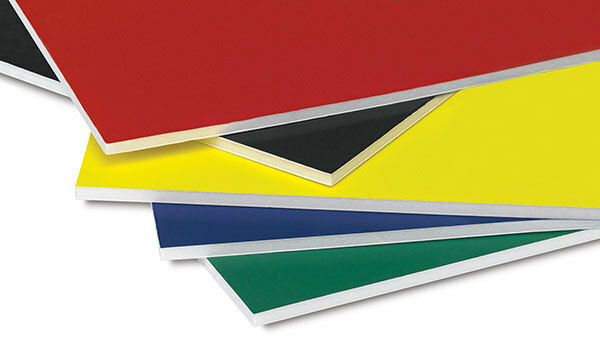 This Colored foam Core board has a built-in memory, allowing it to return to its original thickness after cutting. Laminated both sides with alpha-cellulose virgin pulp clay coated paper, providing a smooth surface and clean cuts. Stiff 3/16" thick , White Foam Core, Colored on 1 side, White on the other. Lightweight, yet strong. Cuts easily, resists warping. Available in : Yellow, Red, Blue, Green.